Whether you’re a manga or comic book illustrator, the best markers for drawing manga can make the difference between a mediocre and an outstanding sketch. This is one of those fields where superlative quality is a must. That is if you want to succeed in your project. Finding the best manga markers is no easy task though. There are a wealth of things to consider, from the type of tips to the types of inks or pigments involved. A piece of advice before digging dipper into the matter to find which are your best bets is to get dual-tipped pens. These come with a fine tip as well as a chisel end, giving you endless drawing and filling possibilities. In most cases, alcohol-based inks are also a better choice when drawing manga. They dry faster, last longer, and provide crisper results. If you’re looking for a set for your kid though, water-based inks may be a safer solution. Also, decide whether you need dozens of colors or just a few hues. While sets comprising over 24 colors are more versatile, a smaller palette could still serve your purpose brilliantly if you’re focusing on mostly portraits. We know that weighing in so much information is not always simple, especially if you’re an amateur or a beginner. So, if you’re still confused on which markers to get, know that we did the hard work for you. We selected and tested some of the best manga pens on the market. Check them out below. Remember, you can’t become the master manga-ka without paper to go with your markers. You may also want to try other types of pens like Japanese brush pens, Japanese fountain pens, and Japanese calligraphy pens. If you want to try something new, there are also programs to digitally draw manga instead! Whether you’re drawing manga for passion or profession, this exceptional set will undoubtedly meet all your needs. 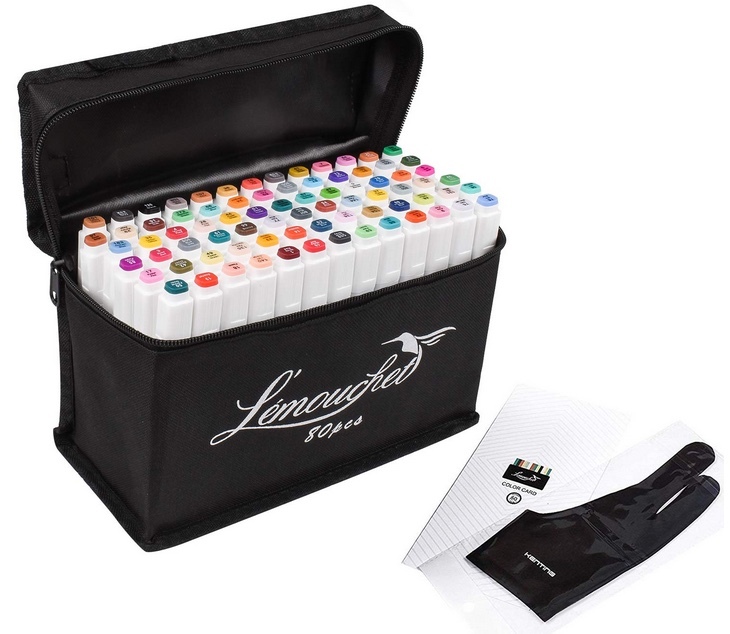 It comes with 160 markers of different colors and is perfect for drawing contours, details, or filling in skin tones. The set is ideal for drawing, sketching, and illustrating thanks to the design of each marker. They are all dual-tipped, offering either accurate line control or superior color blending. At the same time, they also offer paintbrush flexibility, so that you can achieve perfect drawings time after time. The quality of the ink is also outstanding. You can expect no bleeding and no dull hues. A rich color saturation will make your drawings stand out. Because the tips share a single ink reservoir, you’ll also achieve the same color regardless of which side you use. Designed for professionals, the markers also boast ergonomic grip on both ends. We loved the coded color caps with ridges that prevent them from rolling off the table when you’re using more than one pen at a time. And for easy storage and transport, they come in a convenient plastic case. Backed by a lifetime satisfaction guarantee, non-toxic, and highly efficient, these are no doubt the best markers for drawing manga you can come across. Artists shopping on a budget may fall in love with the Prismacolor Premier Manga Illustration Markers. They come in a set of 8 and are specifically selected for drawing. Don’t expect fancy colors, as these workhorses come in black and sepia only. What makes them stand out from the mass is the selection of tips. The black ones have a fine, chisel, as well as brush tips between 005 and 08 inches, while sepia pens have 005-inch fine and brush tips. The set is perfect for drawing crisp details as well as lines of various thicknesses in only one stroke. We also liked the richly pigmented black which is smear and water resistant when dry. You won’t have to break a bank to get your hand on it either. Producing minimal wallet damage, this set is perfect for amateurs and beginners alike. L’émouchet is one of those brands that know how to satisfy their customers. It proposes a set of 80 vibrant color markers you can use for drawing manga or any other art project. The feature that stands out is the quality of these pens. Each one is double-tipped and boasts a broad 7mm as well as a fine 1mm tip. They bring true project versatility, but the advantages of this set don’t end here. A thing we truly like is the alcohol-based, non-toxic pigments. They are so strong that you can cover at least 325 meters of paper with each. The fast-drying composition of the ink makes the markers perfect for virtually all projects. Regardless of what you want to draw, you’ll also be able to find the right hue for your sketch. The set includes all primary colors as well as bright, vibrant shades that can easily enhance your motif or design. Versatile and flexible, the pens are ergonomic and easy to hold. They won’t tire you even when drawing for long hours. We also like that they come in a soft carrying case, while the caps are secured to prevent accidents when traveling. Coming in three set sizes and bringing unrivaled versatility, these manga drawing pens are perfect for all artists. If you don’t care about getting dozens of colors but look for outstanding quality, then the Winsor & Newton ProMarker 12 + 1 Manga Chibi Set could be the right one for you. It comes with 12 brilliant colors, all of which are translucent and blendable. This means you’ll have full flexibility over the color depth and hue. They may be only twelve, but the actual colors you can achieve are much more, all thanks to this outstanding feature. Like other markers on this list, the Winsor & Newton have dual tips. The fine bullet nibs are perfect for sharp detail drawing or writing. The broad chisel on the opposite end is perfect for full motif coverage or drawing multiple line widths. We’re sure you’ll love the quality of the alcohol-based inks, that not only dry fast but provide an incredible tonal range. These versatile colors are also suitable to use on multiple substrates. Don’t limit yourself to just paper and express your creativity on acetate, wood, or glass. While mural drawing may not be one of your options with these, you’ll still get unrivaled flexibility to show off your artistic talent. We know artists get more glory than money; that’s why we included this set on our list. Delivering outstanding quality and coming at a more than affordable price, it makes a great alternative to our best budget pick. This one includes 40 vibrant colors, one of which is a unique white hue you won’t find elsewhere. Providing all primary shades, the set is perfect for drawing, sketching, shading, or illustrating. You can even use it for rendering if you really insist, thanks to the truly fine tips. Superior color blending is ensured by the alcohol-based ink, that bleeds into the paper and dries to really vivid hues. The fluidity of the ink also helps you create smooth, uninterrupted lines. Achieving drawing perfection is easy with these markers. If 40 are not enough, the brand even proposes a set of 80. Whichever your choice, you’ll surely love the versatility and flexibility these markers provide. 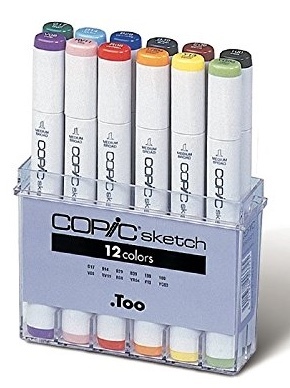 If budget is not an issue and you’re looking for the best of the best, try out the Copic Marker SB12 12-Piece Sketch Basic Set. They may seem expensive at first glance, but the quality they offer is truly superlative. The unique feature of these pens is the super brush nib that delivers unique blending of colors. They’re perfect to use for paint-like applications, although drawing manga with these ones also turns into a state-of-the-art experience. Another outstanding feature is that the markers are refillable. You’ll buy them once, then all you need is ink of the appropriate color. Some artists have even bragged about using the same pen for years, so why wouldn’t you do the same? The alcohol-based ink dries fast and is non-toxic. Either it’s you or your kids drawing, these pens are safe for everyone. We also like the colors. Smooth and vibrant, they deliver unique hues and a brilliance that’s hard to find elsewhere. They may not fit all budgets, that’s true, but when you need the highest quality, this is undoubtedly a go-to set. 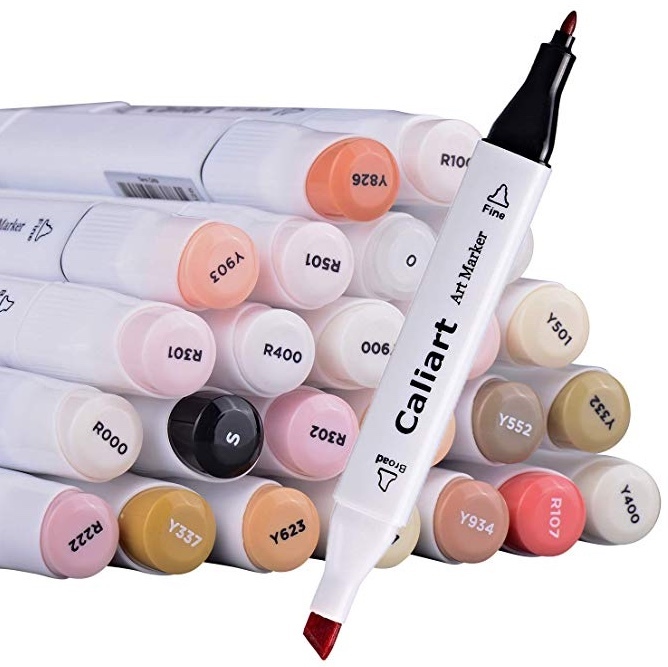 If you have drawn all your sketches and all you need is some color to add life to your characters, the Caliart 24 Colors Skin Tone Markers Dual Tip Twin Marker Set may just save the day. This affordable set comprises 24 flesh-toned markers conceived especially so that you can add color to your manga portraits. Twenty-three skin-tone hues let you draw realistic characters, whether it’s manga or classic portrait drawing. The last marker is a mix colorless pen you can use to achieve a more delicate color. Like most drawing markers, these feature a chisel end and a fine end, allowing you to draw thinner or wider strokes. The ink also allows for exceptional blending, and the set is particularly suitable for those who pursue detail perfection. Backed by a 100% satisfaction guarantee, this set is ideal for anyone looking to add liveliness to a project. Blending high-quality and affordability is not impossible, and one set that brings both is the HSCC 60 Colors Dual Tip Marker Pen. Water-based, non-toxic, and acid-free, these pens are ideal for adult and junior artists alike. The dual-tip design provides precision highlighting and underlining, adapting to most projects. Fun and easy to use, these pens are perfect for drawing or writing, although you can also use them for coloring, scrapbooking, or crafting. We like the full-color spectrum and the fact that all hues are blend-able. Sets comprising fewer or more pens can also suit all artistic needs. The included black storage bag adds more value for money and helps you keep the pens organized. Great for art students, workshops, and classrooms, these colored markers are perfect for drawing much more than just manga. Manga artists and illustrators will certainly appreciate the Sakura 50204 8-Piece Pigma Sensei Manga Drawing Kit. 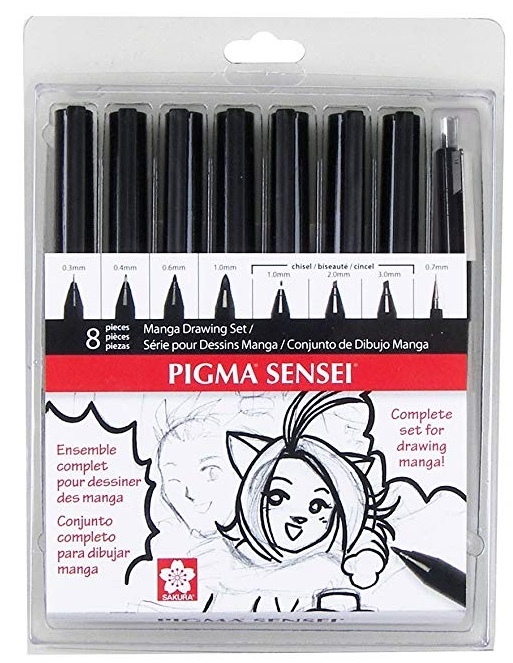 This marker set is developed specifically for drawing manga and comes with eight black pens designed to help you achieve artistic perfectness. All pens in this set comply with the ASTM and ACMI non-toxicity standards and are suitable to use by people of all ages. They are great for concept drawing and sketching, while the quality of the ink has no rivals. One of the best features of these pens is the composition of the pigment that determines the ink’s performance. Indeed, the pigment involved has a big and more chemically complex molecule than other marker dyes. It will not bleed through most types of paper, staying on top rather than absorbing into it. Another great feature is the longevity of the ink. You can expect it to last for years without fading, thanks to its UV and chemical degradation resistance. Waterproof, anti-smear, and fade-resistant, these pens are some of the best markers for drawing manga for artists of all levels. 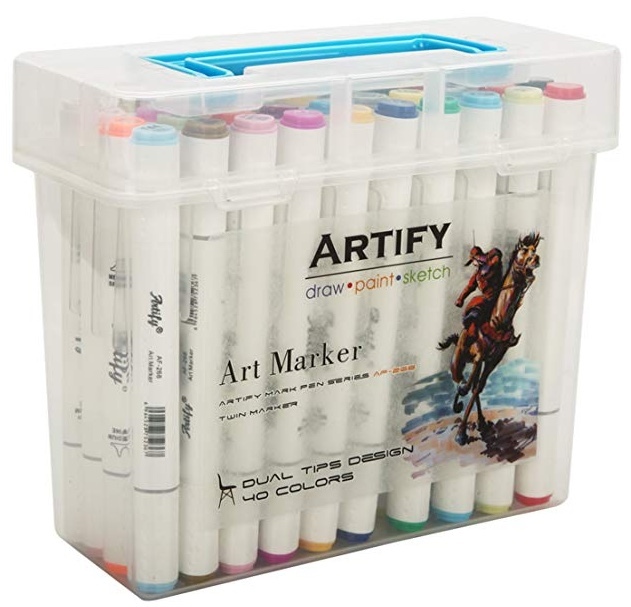 Another set we truly recommend is the Arteza Everblend Art Markers. It comprises 60 colorful markers, each boasting a rich, vivid hue. A selection of primary and secondary colors will give you the possibility to create unique manga drawings without hassle. The feature that impressed us the most is the exceptional blending of the hues, made easy by the clear blender marker. Coming with multi-purpose tips at each end, these pens are also great to use on much more than paper. Glass, wood, and plastic are just some of the substrates they adhere to, giving you the possibility to express your artistic creativity in multiple ways. We really appreciate the carrying case too. Boasting a unique design, the case opens up like a wallet, providing easy access to any of the pens. Due to the design peculiarity, you’ll even be able to keep your pens organized at all times, not only when they’re not in use. A sturdy closure and shoulder strap bring further flexibility, giving you the possibility to take the pens anywhere you like. We also appreciate that the case has 72 slots instead of 60, so you can add a few other pens to your arsenal. Quality markers, a quality case, and full flexibility to draw anywhere and on most surfaces make of this set one of our undeniable favorites.